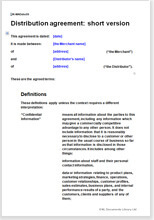 This is a basic agreement between manufacturer or trader and distributor. Drawn to prefer the manufacturer’s interest and protect his goods and his intellectual property. Although referred to as short, it is a full version, protecting the merchant’s products and business and providing an excellent framework for this important relationship. This distribution agreement is for any business selling goods of any type but does not cover export provisions.